Your usual weekends are about to be pumped up with Wallride Park on Chevalla Road. We warn you – this is no run-of-the-mill park with swings and slides. So, come, let’s take the plunge! 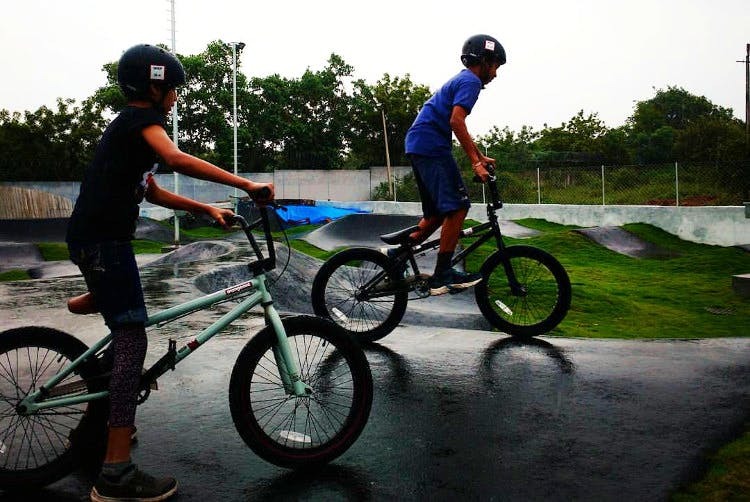 Wallride Park is specially designed for sports enthusiasts who seek thrill in skateboarding and BMX (Bicycle MotoCross) – yes, you read it right! Its location also makes for a wonderful drive, eliminating the slow-moving traffic and constant honking. With a track built to perfection by Switzerland’s Velosolutions, the park is the first of its kind in India. It consists of an Asphalt pump-track, setting it apart from all the other tracks in the country. If you are an expert at stunting on your BMX cycle or can ollie like a champion on your skateboard, you need to get her to show off your skills. You must be wondering if this is going to leave a dent in your pocket, but this budget-friendly park has taken that factor into account and provides packages along with rental bikes and skateboards, at reasonable prices. If you’re a newbie exploring this, they also provide classes on a monthly basis and train you to pursue your passion while ensuring your safety. You can sign up for the classes even if you don’t possess a skateboard or BMX bicycle. They sort all your safety gear along with the bike or skateboard as per your preference at INR 5,000 per month. The park is open until 10.30pm throughout the week except for Wednesdays, and the classes commence on weekends.